Ehud slayed King Eglon during the early wars of the Judges. 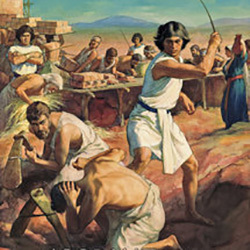 Ehud delivered the people from Moabite oppression by first killing King Eglon and then defeating the Moabites Ammonites and Amalekites in battle. The conflict came because of sin, as the Israelites had mixed, again, with the pagan and their gods. 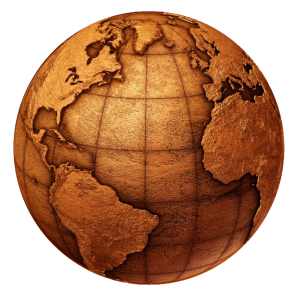 An excellent opportunity was lost for the people chose to intermarry and follow the gods of these nations. Israel was going from bad to worse. They did not rout the enemy. Upon occupation they did not drive them out. Again they seemed to have come full circle back to the same spiritual place they dove into after their greatest deliverance: the worship of the Golden Calf. The people of Israel again stooped down to evil and God produced a fresh enemy to subdue them. This was a new enemy, King Eglon of Moab, who created an alliance with two old enemies of Israel: the Ammonites and Amalekites. They attacked Israel took the City of Palms (Jericho) and cast the Israelites into servitude for 18 years. n, an immensely fat king. 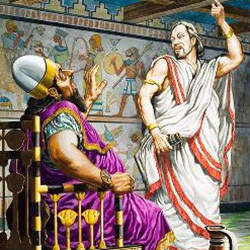 Ehud had prepared a custom weapon for his planned action: a short double-edged sword, not standard in those days. Ehud offered tribute under false pretence. He slayed King Eglon and escaped. 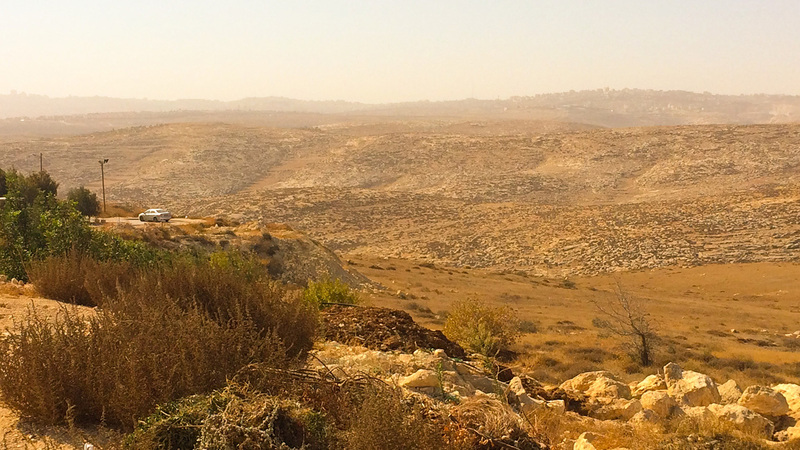 At Seirah he sounded the trumpet on Mount Ephraim where he had stationed the Israelite troops. The People of Israel, won over by this feat, placed themselves under Ehud’s leadership who persuaded them to attack the Moabites by assuring them of God’s guarantee of success. 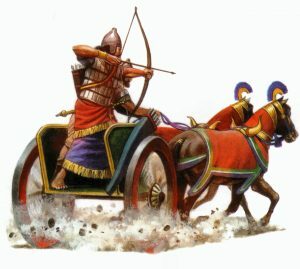 With their leader gone, the Moabites, a nomadic people, were not able to coordinate their response, their allies most likely left them and they lost against a new resolute Army of God. 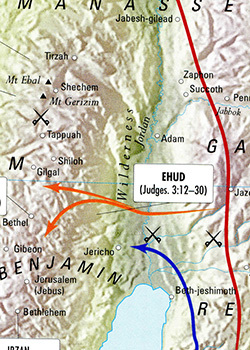 The Israelites advanced and occupied the strategic fords of the River Jordan thus blocking any possible enemy retreat. Cut off from their escape route across the river, the Moabites, although still active and well supplied, were annihilated. 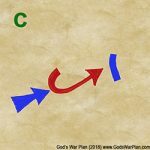 Under Ehud, the Army of God destroyed ten enemy companies. This decisive battle cost the Moabites their independence. The tables had turned and it was the Moabites who now fell in servitude to Israel who found peace for the next 80 years. 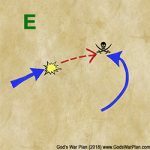 Just as in Sun Tzu’s Art of War, the Bible offers countless lessons on military strategy and tactics. The episode of Ehud is densely populated with these. Do not assume that commanders and troops will behave cohesively. When the soldiers are lions and the commanders are lambs they will be crushed, but even if the soldiers are lambs, when the commanders are lions they will have a much better chance of winning. While the commanders and the soldiers are dependent upon each other, an army without a strong leadership does not stand a chance. 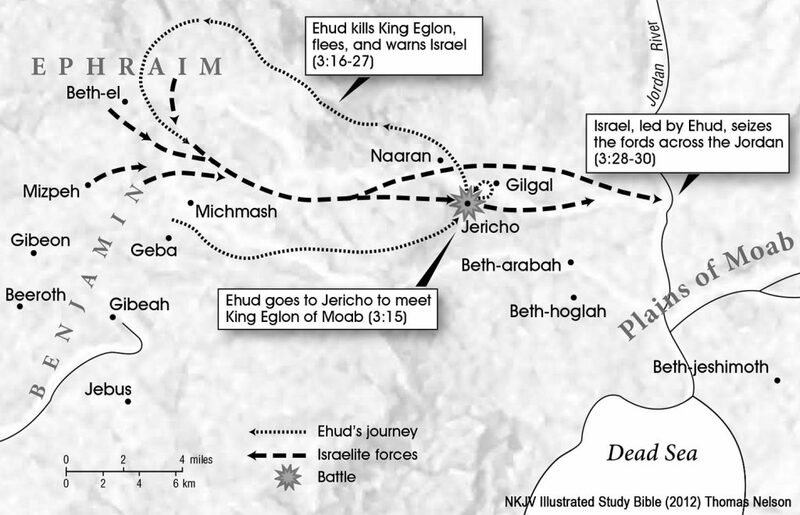 Up to now the Israelites were powerless against their enemy, King Eglon. Their enemy assumed that the new leader, Ehud, was as passive as his subjects. This is why Scripture also specifies that Ehud was left-handed. In the ancient times it was thought that left-handed people were not as smart or strong. 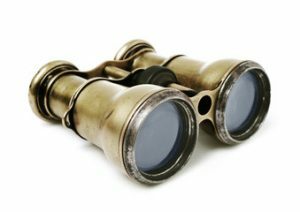 God using Ehud served to conceal the warrior’s true aggressive predisposition further as well as demonstrate, to the people, that appearances are not where they should place their trust. 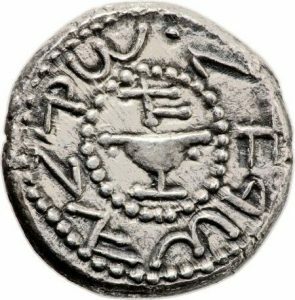 King Eglon underestimated Ehud, which was what caused him to lower his guard and be destroyed. When you have the upper hand do not become complacent. 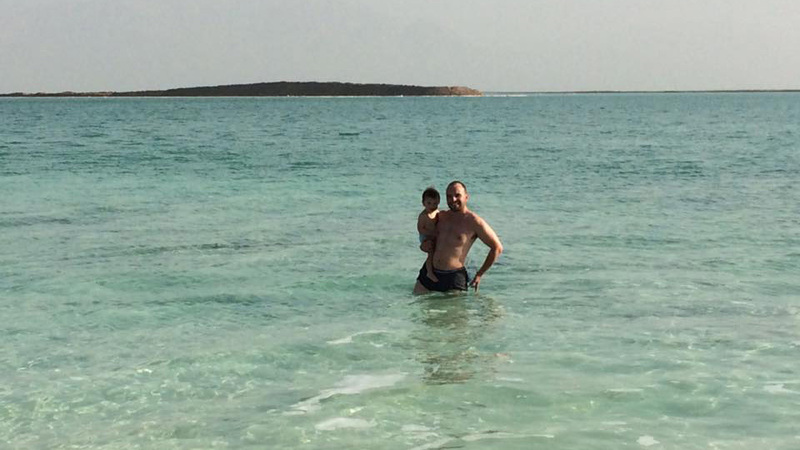 King Eglon, after 18 years in power over the Israelites, became soft – quite literally! Notice that scripture always has a reason for specific details. In this case it reported on King Eglon’s extreme obesity. He thought that the longer he held power over the vanquished Israelites the weaker they would become. 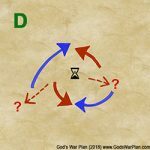 While this seems logical, to a point, it is a double-edged sword, for time gives a foe (even a defeated foe) to learn about their master and plot revolt. 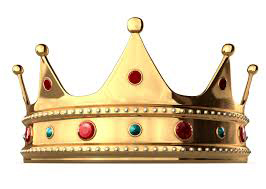 King Eglon erroneously associated being used to a situation with being accommodating. The Israelites were used to their status after 18 years, but they were far from accommodating. Indeed it was King Eglon who became accommodated to his position of power. He relied exceedingly on his numbers and his allies, and he was no longer the feared tyrant but became fat, lazy, perhaps even a figure of fun. (a) Dividing his attention. He now has not only your approaching forces to deal with but a new sector behind him to consider. (b) Dividing his forces. He may choose to thin out his main battle line by sending some troops to protect his rear. (c) Change his entire battle plan. He may choose to do a u-turn with his entire force and move back to engage your smaller rear contingent. If he does this, he will abandon his prepared defences. You can always then abandon the rear, or sacrifice that force while attacking him with you resolute main body which has never changed it is first direction, intent and strike power. (e) Cut off his retreat. 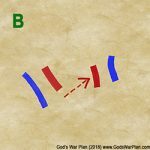 Ideally, you will, as the Israelites did, engage the enemy in a primary battle as planned, defeat him and then cut off the escape route of his main troops, deny him the chance to fight another day and ideally end the war. One of the qualities of a decisive battle is when its outcome establishes a political and social outcome that lasts for a generation, many generations or even centuries. 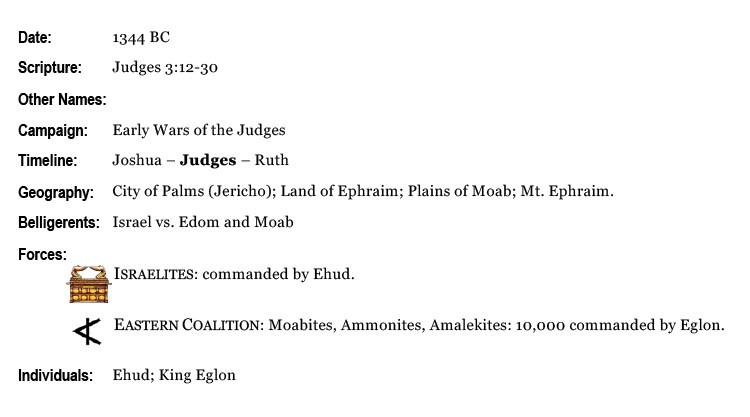 The day that Ehud defeated King Eglon, the people subdued the Moabites. By this Scripture makes clear that no one escaped. Israel destroyed all the Moabites that had crossed the Jordan in their expedition against her. The Israelites did not keep them as slaves nor did they cross over to counterattack the land of Moab to the east of the Dead Sea. To use the enemy’s captured soldiers as spoils of war for labour and to take the attack to the land of the enemy, capturing his capital is militarily justifiable. To go on a counteroffensive and ultimately conquer the enemy’s land and resources is a logical geopolitical move after crushing the enemy in battle. God’s people, however, decided to stick with His precepts for them strictly. 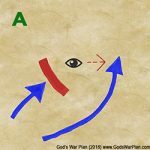 The key instruction that God had impressed upon the people through Joshua, Caleb and the Judges was to not mingle with the enemy’s population and abstain from taking on their customs, which is why annihilation is always a requirement for those peoples remaining within the borders of the Promised Land or crossing over for the occupation of Canaan. The fruit of that obedience was peace for 80 years. In August 1990, the Iraqi dictator Saddam Hussein invaded Kuwait and crushed their military within hours. After a massive build-up, the US-led coalition counterattacked the Iraqi forces in Operation Desert Storm in January 1991. Saddam Hussein was utterly defeated and began retreating. 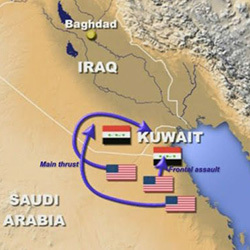 The superior US armoured and air forces could easily have pursued the enemy across the Kuwaiti border all the way to Bagdad and toppled the evil government there, but President George Bush chose to stop at the border. He recognized that the US Army had fulfilled its mandate to expulse the Iraqis out of Kuwait. The Americans accomplished their mission. 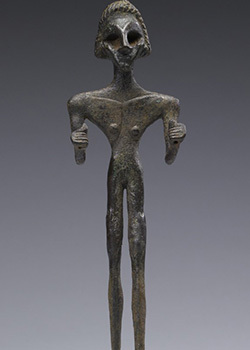 Canaanite mythology described Baal as the god that controlled weather rain. 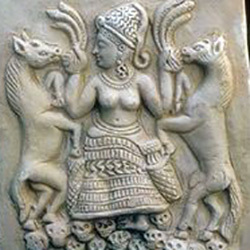 Ashtoreth was the goddess of fertility, love and war. By covering all the major areas – provision, love, procreation, protection and power – Satan had established a crafty way to cause division. The spiritually misguided people now had a opt out to worship the true God. 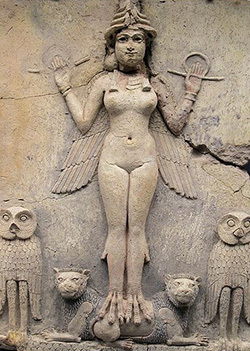 Canaanite legend established that the god Baal had sexual relations with the goddess Asherah in the heavens and this resulted in abundance on earth. We can see the attractiveness of this religion to the hard-pressed Israelites struggling in a new land. 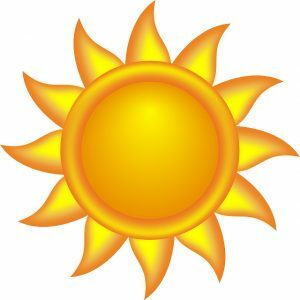 The Israelites, of course, forgot that the reason that the ground produces thistles and thorns was that of sin; their sin. These following this depraved religion were enticed to have sexual relations to mimic what they believed to be happening with the gods in the heavens, thus stimulating the land to be fertile. Of course, there was nothing of the sort going on. 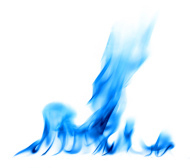 What took place in the spirit realm was much different. Satan cannot create anything; he can only destroy. There was no positive outcome of the fertility rituals. Satan’s goal was to separate people from God by having them commit ungodly acts. These acts were gratifying to the flesh, and so they had no trouble carrying it out. 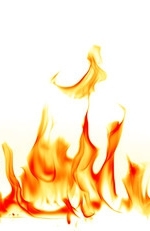 As they continued to sin they were met by adversity, which, without leadership, led them to further pagan worship; a vicious cycle not uncommon in the Old Testament. Today, in the Church Age, as the Holy Spirit has come upon believers, a spiritually healthy Christian, well connected to the Father, knows right from wrong very quickly. They get a strong prompting of the Holy Spirit inside. However, if a Christian persists in doing evil, he will eventually be calloused to it, and it will no longer phase him. When this happened to the Israelites, God eventually released them to their choice and the consequences of sin were allowed to take hold. Romans 1:23-25 NRSV  and they exchanged the glory of the immortal God for images resembling a mortal human being or birds or four-footed animals or reptiles. Therefore God gave them up in the lusts of their hearts to impurity, to the degrading of their bodies among themselves,  because they exchanged the truth about God for a lie and worshiped and served the creature rather than the Creator, who is blessed forever! Amen. “There never was a good war or a bad peace.” Benjamin Franklin.